Red Sonja is always a fun read as the character, like her counterpart Conan, are just good old fighters that find themselves in really strange situations. 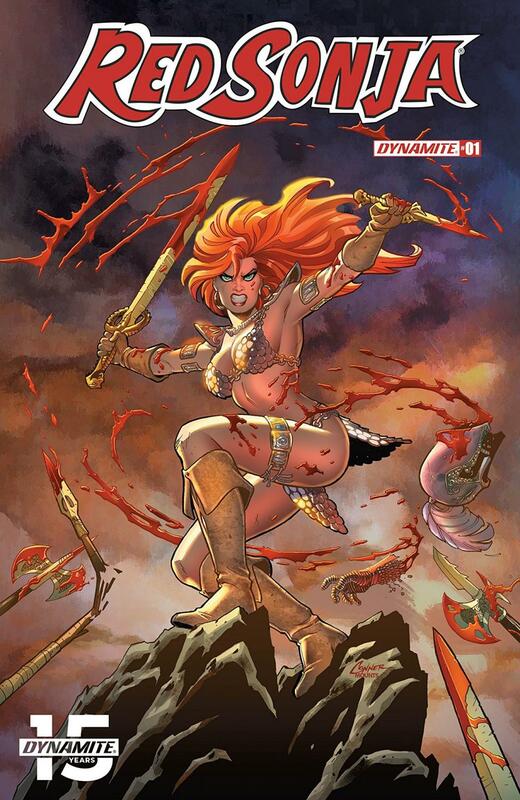 Having Red Sonja relaunched with Mark Russell at the helm of the scripts? This almost becomes a must read. In the past 3 to 4 years, I always make sure to try out a series if I see that Mark Russell is attached. His sardonic humour and astute eye for political commentary are always refreshing, especially as he has used the past, see Flintstones, and the future, see Prez, as canvases to showcase what is wrong with today’s society. Has he brought this to Red Sonja? Not yet, but I wouldn’t be surprised if it pops up. Why, you may ask? Well, this first issue is split in two: the first deals with Red Sonja returning to the place of her birth, Hyrkania, and the second revolves around a conqueror who has expansion on the mind. The conqueror is, as the solicits described it, is linked to a fatal prophecy and due to this fact, sets his sights on Hyrkania, a place that has literally nothing fo consequence to offer any conqueror. Opposed to him we have Red Sonja, newly returned and somehow tasked with dealing with, for all intents and purposes, will be a pretty big mess. Russell does a magnificent job of setting these two opposing forces against one another as he shows, doesn’t tell, why this conqueror may be a little “off his rocker” and also, at the same time, showcases a Red Sonja who might be out of her depth, but clearly won’t be for long. Coupled to Russell’s fantastic script is illustrator Colak’s excellent pencils that do a magnificent job of portraying some quiet moments equally as well as the several fight scenes peppered throughout the issue. Kelly’s colours make Colak’s art pop off the page and really make it a fun read.